Hey guys! 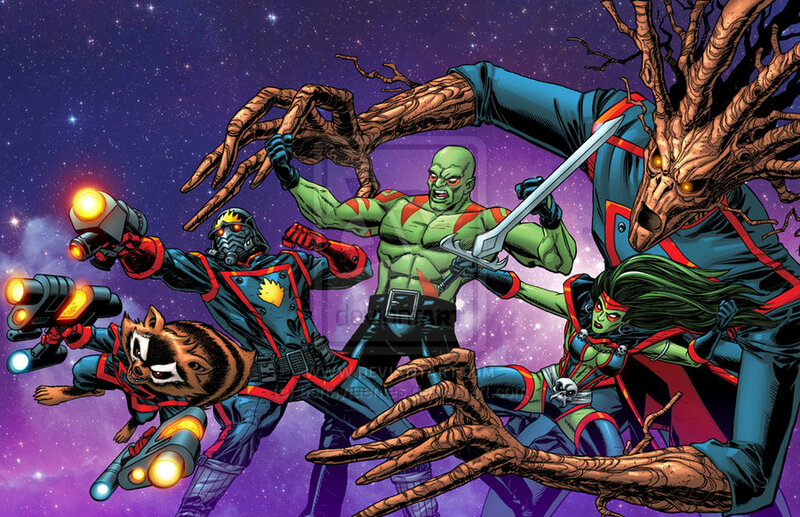 I’m here with my review of Guardians of the Galaxy, even if I am a little late. Chris Pratt’s performance as Peter Quill/Star Lord was fantastic. We all already knew he could act, but I hadn’t really seen him in anything other than the comedy show ‘Parks and Recreation’. I was worried that the character might come off too funny, or too dry-humor if Chris Pratt was trying too hard. Peter Quill came off very naturally, and that was really great to see. Peter Quill/Star Lord is a great character, he’s funny with a serious sort of side, and we see in the movie that he isn’t just a human, but in fact has part of a very ancient alien race within him. His mother dies in the very beginning of the movie when he is very young, and even though we’ve seen that in every Disney movie, it’s given a different twist when he runs outside and gets abducted by a mysterious alien spaceship, and that his mother was most likely dying from whatever Star Lord’s father gave her. David Bautista’s performance as Drax was surprisingly amazing. He had been with WWE wrestling since 2002 until 2010, and that does require a fairly reasonable amount of ability to act, plus he had already acted in two movies beforehand. He was always a great wrestler, and a great character, but it was surprising to see that he truly could act and be a detailed main character. Drax himself is an absolutely great character. Even though he does have, like Starlord, a stereotypical sort of past, he’s well-written. His wife and daughter were killed, and yes that can be a very common past for a lot of male characters, I feel like it works well with the story. He is a very vengeful character, but he does have a goal. I hope they do something good with the character once Thanos is out of the picture. I can understand it being difficult, since a large part of his character is just about getting to Ronan and Thanos and avenging his loved ones’ deaths. I have no complaints about Zoe Saldana’s performance, but I already knew she was an amazing actress. I’m glad she didn’t disappoint, and I’m happy that she got this role. Gamora is wonderful. At the beginning of the movie, she’s very cold and stoic, she has a goal and it’s definitely not to make friends. By end of the movie though, we see she’s very compassionate and caring but can still destroy anyone who harms her friends. She’s definitely a lot more violent in the comic books, but I feel like keeping her a little more calm and more human is better for the character and the audience. Overall, she’s a great character, and I hope they can do more with her in the next movie. I was worried with Groot and Rocket Raccoon, like anyone would be really. I mean, it’s a talking tree and a talking raccoon with a gun. I was worried they would take it way too seriously. Everyone did an absolutely amazing job with both characters. Vin Diesel’s performance as Groot was amazing. It felt like every time he said ‘I am Groot’ he was actually saying something different. That’s what the director wanted, and Vin Diesel gave him that. Bradley Cooper didn’t even sound like himself, his performance was also surprising like Bautista’s. I really felt for Rocket, and by the end of the movie I absolutely loved him just like all the other characters. Groot is the Monarch of Planet X (“His Divine Majesty King Groot the 23rd, Monarch of Planet X, custodian of the branch worlds, ruler of all the shades”) and his language is kind of like a dog whistle- only his kind and other closely related species/races can understand it. That’s why Rocket could have conversations with Groot and truly understand him. Groot is a fantastic character, he’s very loyal and sweet. At the end of the movie he sacrifices himself for his friends, and it shows that he isn’t just a talking tree, he’s just like Drax or Peter, he just can only say ‘I am Groot’. Rocket Raccoon was based off of the Beatles song ‘Rocky Raccoon’, and a lot of things surrounding the character are also based off the song. Rocket, like all the others, is a fantastic character. He’s a surprisingly well written character, and you feel for him a lot of the time. “I didn’t ask to be made” was such a saddening line along with the whole speech in that scene. It gave the character a lot of needed depth. Both Nebula and Ronan are fantastic protagonists and great characters. Nebula is Gamora’s adopted sister, daughters to Thanos. They were both tortured and trained to be assassins, and it’s implied that Nebula got the worst. The fact that she wasn’t really killed, and the implied idea that she can’t be killed in a conventional way, we could easily see her in a future Guardians of the Galaxy movie, and I would love to see her again. I was worried about Ronan the Accuser, like how I worried about Rocket and Groot, being too cheesy. Ronan the Accuser is a bit of a silly name, and in the comic books with that green and yellow color pallet, I was just wondering how they’d change that. Switching his colors to black, red, and eventually purple was a good decision. They’re all very dark yet sharp colors, and it worked better with the character. Ronan overall is an intimidating, scary character. He’s a character I’d be okay with Marvel reviving in maybe Infinity Wars or another Guardians of the Galaxy movie. For the sequel they should explore other options before going back to previous protagonists. Thanos’s first real scene was fantastic, and was what was needed for the movie. For him to have a role but not really a dominating one was perfect. We know he’s going to show up and have that dominating main role in Infinity War: Part 1 & 2, so giving him one in a movie before that would be pointless. His scene fit very well into the movie too, and how he was designed was great, and somehow managed to look realistic yet true to the comic book character. From Peter being abducted to the Milano flying off, this movie’s CGI is absolutely stunning. Every single scene with CGI was amazing, stunning, and absolutely beautiful. The special make-up effects department did an absolutely amazing job too, Drax doesn’t even look like Bautista, he looks like Drax, and if I hadn’t been immediately alerted Karen Gillian was playing Nebula, I wouldn’t have figured it out. Until two weeks ago I didn’t even know Lee Pace was Ronan! They did an amazing job and I can’t wait for the sequel and to see it all again. 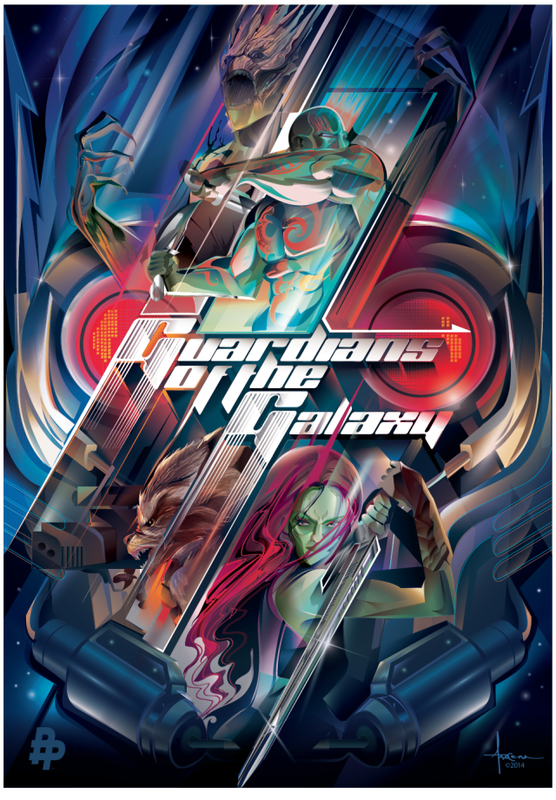 On August 01 Guardians of the Galaxy hits the big screen and could be one of the biggest movies of the year if not the biggest. Marvel is taking a calculated risk that could turn out to be it’s biggest reward with a property that us long time comic book readers are familiar with, but the main stream crowd has never heard of. This is an eclectic group of characters led by Star-Lord/Peter Quill who is being played by Chris Pratt. Anyone familiar with Parks and Recreation knows he is quite funny and it will be interesting to see him bring some of that humor to a more lighthearted character, but still show us the action packed superhero style we have all come to love from Marvel movies. Zoe Saldana as Gamora and Dave Bautista as Drax look perfectly cast in their roles and it will be fun to see what they bring to these characters. The biggest test will be to see how Groot and Rocket Racoon come off in the film. On the surface they could be the two most ridiculous characters we will ever see in film, but they could turn out to be the most popular in the movie. What little I have seen is very promising and I cannot wait until opening night. I am a fan of director James Gunn. I thoroughly enjoyed Slither and Super and really enjoy his unique style of movie making. He is the perfect person to bring these crazy characters to the movies. If this movie turns out to be as good as it looks I sincerely hope people flock to the theaters to see it so we can continue to see more of the obscure comic book characters hit the big screen. I will see it opening weekend and hope everyone else does too.